One year after the successful world premiere of music theater >Z< at the Alternative Stage of the Greek National Opera, who was the commissioner of the work, >Z< will have it's second staging in German language at the Opera Festival of the Bavarian State Opera in Munich. The translation of the poetical libretto by Vangelis Hatziyannidis into German, is signed by Michaela Prinzinger. The politically motivated murder of doctor, pacifist and parliament member Grigoris Lambrakis took place in 1963 in the middle of a street in Thessaloniki and engraved a deep wound in modern Greek history. Staging the story, which was made famous by Costa Gavras’ film of Vassilis Vassilikosʼ novel, in the form of an expressive music theater, >Z<, focuses on the different facets of the human being. 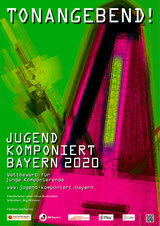 >ROAI V< for viola, bass calrinet & prepared piano will be performed at the opening concert of Jugend Komponiert Bayern, the annual competition for jung composers, to which Minas Borboudakis is artistic director. Beside Borboudakis' work, the Munich based Ensemble Zeitsprung will perform works by G. Aperghis, G. Kampe, A. Korsun, E. Poppe, M. Andre and G. Scelsi. The Munich based ensemble for contemporary music BlauerReiter features the first three parts of the chamber music series ROAI by Minas Borboudakis, which is based on the Heraclitean phrase πάντα ῥεῖ (panta rhei/everything flows). ROAI I for piano trio is developing the idea of the horizontal flow in the music, being followed by the second work of the series for Cello and piano, which is dealing with the vertical movement of the sound through time. ROAI III for piano, electroacoustic & synthetic sounds focuses on the inability of the instrument to produce a flowing sound (like wind and string instruments are able to do) and expands it's sound through the electronic environments. Fabián Panisello's a5, Balthazar and Biltine choral reflections will complement the concert of Ensemble BlauerReiter, titled FACE2face #1. Pianist and harpsichord player Andreas Skouras will perform >six thoughts< for piano solo, written in 2002. The six miniatures describe moments and atmospheres in a poetic and biographical manner. The recital consists works by composers such as Alexander Strauch, Volker Nickel, Michael Emanuel Bauer, Fredrik Schwenk, Anders Eliasson, who have collaborated with Andreas Skouras or have written pieces for him, inspired by his virtuosity. >Kurzschluss< Hommage á Diogenes for viola solo was composed in 2005. The character of the work is oscillating between cynical microtonal passages and anarchic melodic lines which create the "sort circuit" in the music and further, just like the cynical philosopher did, in the society. >light and ashes< for clarinet and live electronics was commissioned by Oliver Klenk, the clarinetist of the Munich based contemporary music ensemble Ensemble Zeitsprung. The work was written in 2015 and was premiered by Oliver Klenk. >light and ashes< has a poetic approach to it ́s own title. Atmospheres of light and shades juxtapose to thick clouds of ashes symbolized by various graduations from sound to noise. Twelve sold-out performances, an enthusiastic audience and brilliant reviews have contributed to the success of the music theater >Z<, which premiered 2018 at the Greek National Opera- Alternative Stage under the baton of Minas Borboudakis. The true story about the political murder of pacifist Grigoris Lambrakis took place in the early sixties in Thessaloniki and engraved a deep wound in modern Greek history. Staging the story in the form of an expressive music theater, >Z<, focuses on the different facets of the human being. >Z< was commissioned by the Greek National Opera.